Battery Powered Nighttime Signaling Electronic S.O.S. The survivor of a forced landing in the wilderness or on the seas usually cannot call 911. Even if the crash occurs in an inhabited area, injuries or other considerations may make seeking help impossible. A fundamental responsibility of any survivor is to participate in their own rescue by helping Search and Rescue (SAR) locate them. When SAR does come looking, or if you want to attract the attention of a passing plane, car or person, you need the means to signal your distress. Ask anyone with experience, they'll tell you it's generally damn difficult to locate a downed aircraft, a life raft, and especially, a single person. The odds of someone just passing by, in the air or on the surface, and noticing the crash are slim. Even on the ground, unless there was an eye witness, it is unlikely anyone will take notice unless they practically trip over you or the aircraft. Finding a survivor can be a bit like looking for a needle in a haystack, difficult under the best of circumstances. Without some means to catch searchers' eyes, the survivor may easily be passed over time and time again, as has often happened, too often with deadly results. Many are the stories of survivors watching SAR pass repeatedly overhead or nearby on the surface and they were unable to attract any attention. Those tales are told by the lucky ones who eventually were found; others were not so fortunate. The more the survivor can do to attract attention, the more likely someone will notice and come to their aid. It is a lot easier to attract attention if you are equipped to do so. Of course, it also helps a lot if SAR is out looking for you. Don't forget one of the greatest aids to survival that a pilot can have. File and activate your flight plan *OR* tell someone you can trust the same information and when and who to call, if they don't hear from you by a certain time. The best plan is to do both. Now, admittedly, the entire VFR flight plan system is far from perfect. However, despite its shortcomings, it's a pretty good insurance policy. If it doesn't appeal to you, then be sure to make other arrangements. Always make sure someone knows your plans and is in a position to request aid if you're overdue. Time is always your enemy in any survival situation. If you don't take these precautions, then you better carry a lot more survival supplies; the odds are you'll be there a lot longer. Autonomous or long duration signals work unattended for hours or days at a time or have an infinite life. Examples would be ELTs (Electronic Locating Transmitters), EPIRBs (Electronic Position Indicating Radio Beacons), strobe lights, radar reflectors and fixed ground signals. Manually operated long lived signals must be manipulated by the survivor, but have a long or infinite useful life, they are not quickly used up or worn out. These may be operated for long periods of time in order to attract attention. In this category we find signal mirrors, flashlights, lasers, whistles, flags and signal fires. Short duration signals are very short lived, generally lasting only a few seconds to minutes. Short lived signals are primarily pyrotechnics - handheld flares, aerial flares and smoke signals. The searchers must be looking in the right direction at the right time to view the signal. This is a risky proposition and many survivors have reported that their pyrotechnics went unnoticed by searchers. So, despite their popularity, they may not be the best choice. If chosen, only the very best are worth having. Sea marker dye and light sticks don't fit neatly into any of these groups, but are important signalling options, depending upon circumstances. The signal mirror is the most basic and best all-around signaling device. Compact and simple to operate, it has been successfully used for many rescues. 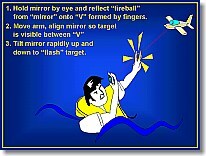 While any shiny object can and has been used for signaling (see illustration for how to do so and click for larger image), a purpose made signal mirror is generally brighter and the best are much easier to aim. In normal sunlight, the flash from a good signal mirror can easily be seen for 10 miles and generally the flash will be visible up to 50 miles, depending upon atmospheric conditions. The record rescue from one is 105 miles, at sea. A mirror will even work on bright overcast days and with moonlight, though with much reduced range. Many experts recommend carrying two as you can then more easily signal in a 360 degree sweep with a little practice. An experienced user can signal up to 270 degrees, sometimes even a full 360 degrees if the sun is high, with a single mirror, but that is pushing it for most users. One mirror per person isn't such a bad idea. A mirror 4 inches by 5 inches (standard United States Coast Guard size) or 3 inches by 5 inches (standard large mil-spec size) is ideal. Anything much larger gets to be unwieldy and can be difficult to use for extended periods or to aim accurately. Even the USCG size can be awkward for those with smaller hands, especially if it is made of heavy material. The smaller 2 inch by 3 inch size (standard small mil-spec size) work adequately and the convenient size is an asset. There are also a few manufacturers that make mirrors even smaller than this. Generally, the bigger the better, since brightness is partly a function of the reflective area. The other determinations of brightness is just how reflective the mirror actually is and how uniform and consistent the reflected beam is, which is determined by its design, the materials used and its condition. NOTE: We are often asked about, or see the recommendation online and elsewhere, the use of a CD-ROM as signal mirror. It is shinny, reflects light, has a hole in the center, and thus looks somewhat like a signal mirror. Moreover, many of us have lots of useless CDs around, AOL continues to send many of more of them, thus its appeal. In tests a CD proved to be only about 20%-25% as effective (distance and brightness at distance, judged subjectively) as a 3 x 5 mil-spec plastic signal mirror, a bit more effective, but not even 50% compared to a small 2 x 3 mil-spec plastic signal mirror. It would compare worse against higher quality mirrors. From an operational persepctive, in an After-Action Report of a major SAREX (Search and Rescue Training Exercise) conducted in 2001 by the Colorado Wing of the Civil Air Patrol, the conclusions were, "that "victims" who had never used a signal mirror (with the aiming hole in the middle) were able to use them effectively, while CD's (AOL etc.) are useless as signal mirrors." It also has the disadvantage of requiring two hands to aim it as compared to a signal mirror with an integrated aiming device, the hole is not an aiming device. The mil-spec plastic mirrors also float, the CD may or may not, and certainly not as well. Given that a good signal mirror is not very expensive and is the most effective daytime (sunlight) signaling device, using a CD hardly seems worth the savings. Not to say you couldn't be rescued using a CD. People have been rescued using the hologram on a credit card to signal with and the CD is far superior to that small reflective surface. A CD makes a decent improvised signal mirror compared to many other options and since they are essentially free, it may be worth carrying some for other members of your crew or party to use, multiplying your signaling capability. However, we cannot recommend a CD as a primary survival signaling device. For decades the double layered glass military signal mirror has been the standard against which all others are judged. While they work exceptionally well, the heavy weight of the glass, coupled with its relative fragility are definite drawbacks. They are constructed of two pieces of glass, one mirrored, glued back to back (these days using two strips of double-sided tape), with a clear aiming "spot" in the middle. Instructions for use are visible through the back piece of glass. A metal grommet in one corner is provided for attaching a lanyard or tether. The edges are not sealed and they do degrade or delaminate after a time if subject to water immersion, as might occur in a water survival situation. The brilliant "fireball" presented through the aiming spot makes aiming the reflected fireball easy. The fireball is produced by retrodirective reflection from small metalized glass spheres adhered to a mesh grid or cloth disk with a center hole. This disk is in the clear spot between the two pieces of laminated materials, glass in this case, used to make up the mirror. It is possible to signal without such an aiming device, and necessary at highly oblique angles, but it can be more difficult, especially without training or clear instructions. Rescue Reflectors offers superior glass signal mirrors, see below, thought for almost double the cost of the Japanese made units. Another traditional mirror material has been steel, either stainless, highly polished, or chrome plated. The steel mirrors certainly aren't fragile and will withstand considerable abuse, but they also have their weaknesses. At best they are considerably less bright than the glass mirror in part because they simply are not as inherently reflective and also because they tend to have a lot of distortion. The most effective metal mirrors also are a bit on the heavy side, equalling or exceeding the weight of equivalent sized glass mirrors in some instances. Those that aren't heavy usually have tremendous amounts of distortion, further reducing their effectiveness. Even the stainless mirrors are subject to corrosion and rust (stainless steel just resists rusting, it cannot prevent it) and the plated ones will rust very quickly in a salt water environment. Both types are easily scratched and dulled. To maintain optimum effectiveness they must be kept wrapped in their sealed protective wrapping. That effectively precludes practicing with these mirrors, unless you have a spare. These mirrors do not have the reflective aiming spot, simply a hole or cross in the center. Depending upon the design, they may have some aiming capability which creates a somewhat bright ring around the hole when aimed properly, but this is not as easy to use, nor as effective at higher angles as the reflective grid style. As a result, they are much more difficult to aim, especially for the untrained, and require the use of both hands to shade the back so you can easily see the ring. You cannot always count on having both hands free or usable. In the past decade, lightweight plastic signal mirrors have become commonplace. Being less cumbersome, the lightweight mirrors are more likely to be carried and weight is always a consideration for pilots. The small ones will easily fit in your pocket and are so light as to be virtually unnoticeable. Most will also float if dropped into the water, a consideration for life raft use. The earliest ones were not very good and there are still plenty available that are no better. Typically, these are single layer acrylic mirrors, as used on many consumer products. The reflective backing is not very good and both it and the mirror's the face is easily scratched, potentially diminishing the reflectivity of these mirrors and their effectiveness. Sometimes they come with a very thin semi-opaque plastic cover on the face which offers some protection while packed, but which cannot be put back on. They may have a hole drilled in the center, but have no reflective aiming spot. Considering how inexpensive better quality one are, there's no reason to purchase any of these. The 2 x 3 inch "10 Mile Signal Mirror" from Skyblazer ($9.45), is an evolution of this basic design. A backing label with instructions protects most of the reflective coating. A center insert with a grid in the aiming hole is claimed to create a "glow" with which to aim. In my tests no "glow" was evident and it was no easier to aim than designs without this insert. The best mass-produced plastic signal mirrors is a mil. spec. design offered by Survival, Inc. (formally S.O.S. Survival Life Support) and at retail under the Ultimate Survival brand. It represents the best value and most compact, lightweight and easily carried package, so in that respects it is the best for a large majority of users. The reflective backing is protected, sandwiched between a pair of polycarbonate surfaces ultrasonically welded together and hermetically sealed. An integral molded rim protects the mirror, makes it easy to grip and provides a lanyard hole. The reflective aiming star is locked into the center. Though not included on the Ultimate Survival versions, they also make a peel off, reusable heavy plastic cover that protects the mil-spec mirror's surface from damage and can be reinstalled after use (provided you either kept a small corner attached or were careful to keep it from getting dirty). It's actual design use is to prevent an inadvertent flash from giving away a combatant in hiding. If your mirror is not so equipped, likely the case, care should be taken to prevent the mirror from being scratched in storage. Instructions are on a label which covers the back side of the mirror. The aiming hole presents a fireball, which though it isn't quite as bright as the glass mirrors, is more than adequate. While not as reflective as the glass mirrors, they are the bright enough to pass military specifications and quite adequate. The 2 x 3 inch model ($8) weighs only .75 oz, the 3 x 5 inch model ($10) is 2 oz. The smaller mirror was sold under the "Gerber" brand name for a few years. Given the low cost, light weight and excellent performance of the Survival, Inc. mirrors, there is no excuse for anyone to be without one in their pocket. Rescue Reflectors, Inc. produces some plastic mirrors with even better performance, though they are a bit more expensive and not nearly as compact a package. There is also a weight penalty, though it is relatively insignificant in the grand scheme of things. These are each handmade with aluminum reinforcement laminated between the two layers of plastic to reduce distortion. Each mirror is adjusted by hand before final assembly to give optimum performance. This results in a very bright reflection, superior to all but the glass mirrors. The plastic itself is coated with a clear "abrasion resistant hard coat" for protection. The edges are sealed with a synthetic rubber. There is a large and very effective reflective aiming hole which produces a fireball as bright as any from a traditional glass mirror. A looped 48 in. nylon lanyard is permanently attached to the mirror. The mirror is backed with a retro-reflective red film which reflects back any light that might hit it, such as from a searchlight. Instructions are printed on the red retro-reflective film. The mirrors are packed in a heavy plastic zipper lock resealable pouch. The 3 x 5 mirror's pouch is .010 vinyl with an integral lanyard hole. The other mirrors use lighter weight .006 poly pouches with a brass eyelet for a lanyard. I'm not too sure about how well these lighter weight pouches would stand up to the long term abuse of being carried in a pocket, for example, though they would be fine packed in a kit. Besides the normal instructions for use printed on the back of the mirror, also included in the pouch is a very comprehensive, well illustrated set of instructions for use of the mirror, printed on an 8 1/2 x 11 piece of waterproof paper and rolled up and secured with a pair of Viton o-rings. A pair of anti-static plastic cleaners in individual foil packs are also included. These hand crafted signal mirrors are a labor of love for the designer, Malcolm Murray, and it shows. They are simply the best performing lightweight mirror available. For those who can live with the added bulk in the packaging and minimal extra weight, the extra cost is well worth it. Rescue Reflectors also offers handmade glass mirrors with nearly full lamination which come packed in either foam padded resealable plastic pouches which float if sealed or buoyant hinged steel hard instrument cases with a foam cutout for the mirror. The mirrors have the red retro-reflective backing, rubber edge sealant, and nylon lanyards installed. Included are the waterproof instructions and anti-static cleaners. A brass eyelet in the pouch or a brass clip on the case allows you to secure the mirror. These glass mirrors are truly waterproof and far superior to the original mil-spec glass mirrors or those made in Japan. Another polycarbonate mirror is being marketed by both Safe Signal and MPI Outdoors as the "Safe-Signal Day/Night Signal Mirror." This is also a two piece mirror, 2 1/4 x 3 1/4 inches ($12), but with red tinted polycarbonate on one side and a normal mirror on the other. A slightly different configuration of this mirror, 1 7/8 x 3 7/8 inches, is offered by the manufacturer, Safe-Signal, for the scuba diving market. Both mirrors come with a protective pouch, but there are no instructions on the mirror or pouch, only on a separate paper sheet included in the packaging materials, a serious failing in my view. They recommend the red side can be used at night with a flashlight beam reflected into it to create a "red flare." They claim this is more visible at night. My testing doesn't support that claim. The reflected red light is considerably dimmer and less visible than the flashlight itself used as a signal, and is more difficult to aim. While a red signal might possible stand out against other lights or the moonlight reflected off the water's surface, that isn't generally the situation for a pilot and the relative dimness really works against it. I cannot recommend this product be used as suggested by the manufacturer. As a conventional signal mirror, disregarding the red side, the lack of an aiming hole is a serious disadvantage compared to a true signal mirror. All in all, it doesn't live up to its marketing hype and is not a very practical survival mirror compared with the better ones available. The standard 8 and 12 hour light sticks are barely visible from a mile away, even when swung on a lanyard. These 8 and 12 hour lights would be fine if searchers were using night vision equipment. Their big advantage is that they last so long, all night in most cases. The 30 Minute High Intensity and 5 Minute Ultra-High Intensity light sticks were much better, being plainly visible from a mile away. In all cases, swinging them on a lanyard or in wide sweeps of the arm made the lights much more visible. Waggling a light stick in the hand did not increase its visibility. There was no significant difference in visibility among the different colors of Cyalume lights tested. Note that all these chemical lights have a limited storage life. Expiration dates are marked on their packaging. Their performance goes quickly downhill after passing the expiration date. Also, bear in mind that exposure to air will adversely affect their life and after a few days' exposure they will not work at all. Thus it is critical that their airtight foil packaging be preserved when packing them into a kit or survival vest. An alternative to the chemical lights are battery powered tube lights that aim for the same market. One example that we have looked at is the Krill Lamp. A strobe light is effective at night and the best ones can be seen for up to 5 miles in ideal conditions. Visibility is less in many circumstances, however. Often substantially less. While blindingly bright at close range, they are surprisingly less bright from the air. This is because all that light is dispersed over an entire hemisphere, but with the majority directed vertically in most cases. The biggest advantage of the strobes is that they operate for extended periods unattended. Even if the survivor is unconscious, the signal is sent. While not as bright as some other signalling devices, the rapidly flashing light does stand out against the dark, unlit background of the wilderness or open water and will be noticed by SAR if they come looking, but may not necessarily be noticed by passersby. With night vision equipment, it is very obvious, from many miles further out. Ironically, light fog or mist will make the strobe site much more visible, provided it isn't heavy enough or high enough to cut down air to ground visibility too much. Directing the strobe in the direction of searchers (remember, most of light is reflected vertically) helps increase visibility as does use of an improvised reflector. Don't forget extra battery(ies). Note that operating life given by manufacturers represents minimum performance to meet specs at full brightness and flash rate. They will all operate at a diminishing rate for 2 to 4 times the rated life. The ACR Electronics venerable "Firefly 4F/4G" is a survival strobe with which many pilots are familiar. It is the civilian version of the mil-spec SDU-5/E and both units use the same proprietary battery. The original mercury battery used in older versions of this strobe is no longer available, but a replacement lithium battery (model LLB-1) is available from ACR. Note that the included brass cap of the new battery extends down quite a bit further than the original which was an integrated one-piece unit. An alternative to this expensive factory supplied battery is the SDU-5/E Battery Adapter 5BA by PRC68.COM that allows use of commonly available lithium size 123-cells. I have not personally used this, but others report good experiences with it. Newer strobes offer the advantage of being less expensive, lighter and use regular alkaline, or better, lithium batteries. ACR's "Firefly 2" has replaced the Firefly 4/F/4G (and the SDU-5/E) using two AA-cell batteries. The military version is the The MS-2000(M) family. With lithium AA-cells it works even longer. MPI Outdoor's "Emergency Strobe" uses a single D cell battery. Both are USCG and SOLAS approved. Not nearly as bright, but much smaller, is Tektite's "Mark-Lite Strobe." This single lithium AA-cell strobe can also be converted to a flashlight by exchanging the strobe unit for a reflector unit. It may be a viable choice where space is at a premium. Tektite also offers a larger "Strobe Torch" which runs in excess of 30 hours (at room temp) on 2 C-cell alkaline batteries. It also can be converted to a flashlight. The same unit is also available as an "F" model using 2 AA cells which give it about half the operating life. The tradeoff for the shorter operating time is that the "F" model floats. ACR's "Firefly Plus" is a combination strobe and flashlight, located on opposite ends of the tubular body. It uses two AA-cells and is not type approved. At first glance this may seem like an appealing product, offering "two for one." It really isn't, because when you have need for either piece of equipment, in all likelihood, you need the other as well and it cannot be in two places at once. On a raft, it might not be such a problem, no one is going anywhere. An additional concern is that the rotary switch on the body is easily turned on inadvertently. If you have one of these, be sure to tape the switch in the off position. The performance of all the mil. spec. and Coast Guard approved strobes is very similar. The choice comes down to price and packaging. The best value is the MPI "Emergency Strobe." The D-Cell makes it a bit bulky and cumbersome and lithium batteries, which I prefer, are somewhat difficult to locate in that size. My favorite is the ACR "Firefly 2" which offers a compact, flat and more easily packed form factor, but at a significant premium. It is a lot easier to install batteries in this unit than in the D-Cell units. Lithium AA size batteries are readily available. I also preferred the switch on the Firefly 2, deeming it the least likely to be turned on inadvertently. Having said that, the least expensive effective performance for night signaling is obtained from the lowly flashlight. Directed light is generally more effective than when the light must cover all directions, as a strobe does. It requires far higher light output from a strobe to equal the effectiveness of a small flashlight wielded by a survivor. Even the smallest of the incandescent flashlights recommended in this text is visible at greater distances than the best commercially available survival strobe. However, it requires the user to operate the flashlight and flash it in the direction of searchers. A recently introduced innovation in nighttime signaling is the Laser Flare. This builds on the advantage of directed light as emitted from a flashlight by using a laser. The Laser Flare is much more effective than a typical handheld flashlight, is compact and long lasting. Its brightly colored flash is very distinctive. The down side is that it relatively expensive. Read our evaluation of Laser Flares. ELTs (Emergency Locator Transmitter) are notorious for going off when we don't want them to, and not going off in a crash, when we need them. Since we cannot count on the aircraft's ELT, it's good insurance to carry a personal sized, manually operated beacon. 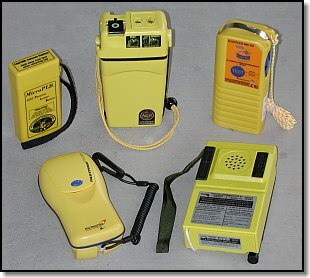 In the past the choices were limited to 121.5 MHz beacons such as Emergency Beacon Corp's "EBC-102" (which I carried) or "B" class (manually operated) EPIRB (Emergency Position Indicating Radio Beacon), the marine equivalent to an ELT, such as ACR's "Mini-B2." Among their many drawbacks, processing of 121.5 MHz distress signals by COSPAS-SARSAT is going away, and for good reason in our opinion. 406 MHz distress beacons are a lot more effective, providing a much more powerful 5 watt signal and much more precise locating by the COSPAS-SARSAT satellites, along with personal identification. The 406 MHz beacon is particularly valuable outside the mainland U.S., especially near the equatorial regions and in the southern hemisphere where satellite coverage for 121.5 MHz isn't anywhere as good. For a comparison of the 121.5 MHz and 406 MHz beacons, check out this comparison chart. We believe that anyone serious about survival should carry a 406 MHz beacon. Click here for more information on the COSPAS-SARSAT distress alerting system and how it works. Each 406 MHz beacon must be registered, at no cost, with NOAA (National Oceanic and Atmospheric Administration), or your national authority if you live elsewhere in the world, who maintain the database for 406 MHz emergency beacons. Each 406 MHz beacon has a unique digital code, so search and rescue will be able to immediately know who owns the beacon. On August 22, 2003, NOAA opened up their online 406 MHz beacon registration system, making it even easier to register. By checking the phone numbers provided when the Personal Locator Beacon is registered, this cuts down dramatically on false alerts and wasted resources. It can also allow authorities to more quickly launch SAR assets when they are able to confirm the likelihood that it is a real alert and the general or specific location even before a location is received from the LEO satellites. The FCC finally approved the sale of Personal size 406 MHz "PLBs" (Personal Locator Beacons) in the U.S. in July, 2003. Click for an article on PLBs. These units are available from Northern Airborne Technology (NAT), McMurdo / Pains Wessex, Microwave Monolithics and ACR Electronics (current as of 03/2003). "ET phone home" has become a reality with the lowered cost and availability of satellite phones (sat phones). A number of international rescues have been made using sat phones. For those who can afford the cost and the have the room, they have become viable means to call for help, literally. Virtually everyone we work with that is engaged in international travel via general aviation or boat has outfitted themselves with a sat phone of some sort. Canadian outdoorsman Bill Layman suggests they should become standard equipment for all wilderness travelers in this article on ETS. If you're flying over water, make sure you pack it inside a waterproof pouch or case. None of the sat phones are not waterproof. Companies such as West Marine and Aquapac have specially designed cases that you'll want to get; they aren't expensive and they could be lifesavers. Because these phones are only available with rechargeable batteries, have limited battery life, an are not waterproof, they are not a substitute for a 406 MHz emergency beacon. Having said that, they would be the next piece of critical equipment after the beacon that we'd want to have available for any serious wilderness or overwater travel. If you manage to salvage a handheld comm radio from the aircraft, it can be a valuable survival asset, allowing you to communicate with passing aircraft or Search and Rescue. Read about two similar survival episodes and what a difference a handheld can make in William Waldock's "A Question Of Survival." If you carry a handheld in the plane or car, and you should, it would be a wise move to pack a spare battery or set of batteries in the survival kit. If the comm will operate off standard AA cell batteries, best to pack lithium batteries instead of alkalines, if it will operate on them (check with the radio manufacturer). If you're flying over water, make sure you pack it inside a waterproof pouch or case. Most civilian aviation handhelds are not waterproof. Companies such as West Marine and Aquapac have specially designed cases that you'll want to get; they aren't expensive and they could be lifesavers. They also make such cases for cell phones, GPSes, and other useful gear. The first truly submersible aviation handheld that is as waterproof as the typical marine handheld was introduced by Vertex Standard in 2003, the VXA 700 "Spirit." This compact radio incorporates not only the VHF aviation comm and navigation frequencies, but also 2 meter amateur band (HAM) and weather and FM receive only as well. It is waterproof to the JIS 7 standard; 1 meter for 30 minutes. The whistle is a vastly underrated signaling device. Certainly, SAR flying overhead isn't going to hear it, but it may be heard by passersby or by ground search teams. A whistle is far superior to shouting, a virtually useless effort. The whistle will carry for 1/2 to 2 miles or even more in the wilderness where your voice may only carry for a few hundred yards, at best, but often much less, depending upon the circumstances. You will also be able to signal for much longer periods of time, whereas your vocal cords would have given out long before. The shrill and unmistakable blast of a whistle, repeated three times, the universal signal for help, will definitely attract attention if anyone is within earshot. Two whistles, they hardly weigh anything, also allows for safe reconnoitering of the area without the chance that someone will get lost. It's bad enough to be down; getting lost from your fellow survivors would really ruin your day! The new high tech whistles such as the "Storm" (from ALL-Weather Safety Whistle Co.) and the "Fox 40" (from Fox 40 International) and the smaller, more compact versions of these super whistles, the "WindStorm" and "Mini-Fox 40" are much louder than the traditional G.I., police or the old fashioned flat survival/lifeboat/safety whistle. These whistles cannot be overblown and work even in the water. I pack the "Storm" in my kits, where bulk isn't as big a concern. When flying or day hiking I carry a Windstorm. For everyday carry I have a modified Mini-Fox 40 whistle in my pocket. By filing down the superfluous side pieces designed to make it look like a conventional whistle, it becomes much less bulky, not much thicker than a traditional flat whistle. Not as good as the Storm whistles, but a whole lot louder and more effective than traditional ones. Please note that a whistle should be considered an essential item of personal equipment for children of any age. In my opinion, no kid should be allowed to go anywhere without a whistle, especially out in the woods. I suggest it be hung around the child's neck and left there. It'll be a lot more effective, if the kid gets lost, than any charm hanging on a chain, religious or otherwise. Check out Tweeet In Time Save's Lives about an innovative free rescue whistle distribution program for kids and A Kid's Wilderness Survival Primer which is exactly what it says. Having said that, the whistles I recommend above are not very small and a kid may well balk at wearing one of them. Any whistle is far better than none, however, and there are any number of small flat ones that will work adequately. The smallest flat survival/safety (pealess) whistle is the ACME "Tornado" Model 636 which is made in England and sold in the U.S. under the Skyblazer and Orion brand names. It works quite well, and though not as loud as the Storm or Fox, it will surely attract attention. If even that is too bulky, or not quite fashionable enough, most jewelry stores will have, or can get you, a small silver whistle. The best of these seem to be tubular in design and bigger is better than smaller, if there is a choice. While these are not nearly as loud as any normal survival whistle or even a conventional police/G.I. whistle, they are still better than relying upon voice alone. The bottom line is, don't let them out of the house without some sort of whistle hanging around their neck. The key to any ground signal being noticed is to remember that there are very few straight lines or right angles in nature. You must also remember that things are a lot smaller when viewed from the air, so bigger is almost always better. Finally, contrast is another attribute that ensures the signal stands out. A roll of fluorescent orange, pink or deep blue (yes, believe me, deep blue is very visible in many environments) surveyor's flagging tape can be laid out in a "V" or "X" or draped or thrown over trees to make a signal (small pieces of flagging tied to bushes are useless). It is best to make as solid a signal as possible with the tape, as this is visible from the furthest distance. It can also be staked to the ground or just above it to provide contrast and motion for large ground signals. However, after much experimentation, I've come to the conclusion that it isn't the best choice as a ground signal. On the other hand, the tape comes in very handy marking trails or locations of snares, traps, etc., so it's got a place in a survival kit. Aluminum foil will also work as a ground signal, laid out in a "V" or "X." For that matter, any large piece of opaque and/or brightly colored material will stand out from the natural terrain. Adding a vertical component, such as with a tube tent or tarp set into an "A-frame" or lean-to, greatly increases the visibility from a distance, especially in unforested terrain. Sea marker dye isn't just for use in the water. It makes a highly visible bright green signal when spread on snow. For water survival use, sea marker dye has been the traditional answer to making a person or raft in the water a bigger target and more noticeable. This comes in a number of types of packages, of various sizes, but inside all those available commercially in the U.S. are virtually the same. The powder creates a bright day-glo green "stain" in the water, and as the raft or survivor drifts, the green tail is visible from quite a distance. Unfortunately, it doesn't last very long, dissipating in about 30-40 minutes in dead calm waters, much less in rougher waters. While the color appears "florescent," it does not glow in the dark and is virtually useless at night. It should be noted that this dye is quite caustic in high concentrations. If you accidentally sprinkle it on yourself, or drop some inside the confines of the raft, it will burn. This is less of a problem in open water, but it is still best to deploy it away from you if you are in the water and in such a manner that the dye trails behind you. Standard aviation raft survival equipment packs come with one sea dye package, either the larger mil-spec unit or the much smaller, truly inadequate version by Skyblazer. Because it is so short lived, they really ought to include more than one, especially if using the smaller Skyblazer unit. The Skyblazer package is also more prone to leakage, which can also cause problems. In answer to the many drawbacks of sea marker dye, Dr. Robert Yonover developed an alternative to sea marker dye which he originally named "SEE/RESCUE." This is now marketed under the name "RescueStreamer" by Rescue Technologies Corp. The U.S. military has tested and approved it as a substitute for sea marker dye in military survival kits. In essence, this is a long bright orange plastic ribbon that floats, creating a very visible signal on the water's surface that does not disappear as the sea dye does. The Rescue Streamer comes in various packaging 6 inches wide by 25 or 40 ft. long or 11 inches wide by 40 ft. long. The 11 inch version is packed in a tube about the size of a typical SOLAS style parachute flare. In U.S. Navy tests, the 11-inch was able to be seen from a distance of 1 1/2 miles (2.4 km) away at a search altitude of 1500 ft. (457 m) and the 6-inch by 25 ft. was visible from 1.3 miles (2.1 km). Note the relatively small difference in visibility between the 11 and 6 inch versions in the Navy tests. This gives a strong clue as to why it works so well. Long, straight, brightly colored lines are not natural on the water (or on land for that matter). As such it stands out like the proverbial sore thumb. Think of a life raft as a small period on the vast expanse of blue paper that is the ocean. Difficult to find at best. Think of the RescueStreamer as the exclamation point! The RescueStreamer tag line is "you have to be seen to be rescued," and it is really true. The RecueStreamer makes an extraordinary difference from the standpoint of aerial SAR. Military versions are also offered in IR visible styles and with different packaging. The bright orange RescueStreamer is also a good ground signal for land survival use. It is substantial enough to be seen from typical search altitudes. A plastic Sea Dog safety clip extends from the end of the tube. This is attached to the RescueStreamer rolled up inside and is used to attach the device to the life raft or life vest strap. To use you simply remove the roll from the tube and manually unroll the plastic film. This is easy to do from a life raft, a bit more difficult, but still doable from in the water. The RescueStreamer will trail behind. Small plastic stringers help stiffen the plastic and, surprisingly, keep it from twisting or staying twisted. In testing, we purposely twisted the RecueStreamer in the water to see what happened and within 5 to 20 minutes, depending on how many we put in, all the twists were removed from the device. 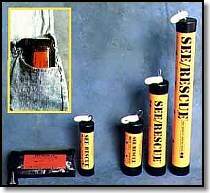 The RescueStreamer offers a host of advantages over traditional sea marker dye. The 11-inch version would be an excellent addition to any life raft survival equipment pack or ditch kit/grab bag. I strongly recommend the RescueStreamer to any life raft owner or purchaser. The smaller 6 inch version would be acceptable for individual use. I've added one to my personal overwater survival equipment. The only drawback for aviation life raft use is that it is somewhat bulky, which can be a problem in packing aviation life rafts where volume is often a consideration. Winslow LifeRaft Co. include various sizes of the RescueStreamer in many of their aviation and marine life raft Survival Equipment Packs. A defective opening mechanism in some 12-gauge plastic flare guns manufactured by Olin (now Orion Safety Products) prior to 2000 may not open wide enough to accept a flare cartridge. Guns with a modification to correct the possible problem are marked with U.S. Coast Guard approval code 160 028//12/1. Boaters with older flare guns should check the operation of the opening mechanism now and at the start of each boating season. If the breech will not open wide enough to accept a cartridge, the gun should be sent back for a replacement. Send defective guns to: ORION SAFETY PRODUCTS, MARINE DIVISION, 3157N. 500W, PERU, IN 46970; 1-800-851-5260. Pyrotechnics are long time favorites for survival or emergency signalling, but have significant drawbacks. At best, they last a few minutes, many last only a few seconds. Flares and pyrotechnic devices are of limited use; one shot that you have to hope get noticed during their brief moment of glory. You are gambling someone will see them, even when you have lots. However, in all fairness, it must be noted that many survivors have been rescued as a result of signal flare use. If you plan on using them, be sure to carry plenty to compensate for their short endurance. However, the most effective ones take up a lot of room and weigh a lot. This is a double whammy for aviators for whom both space and weight is generally quite dear. The other problem is the relative danger involved using some of these devices. In training we've seen people inadvertently burned and life rafts holed. And, this wasn't in the sort of stress filled, difficult circumstances in which a survivor might need to use these devices. They have also been known to start forest or brush fires. These will likely get noticed, but it isn't a recommended method of attracting attention. It could also kill you and many others and should you survive and be rescued, the bill you receive for putting out the fire may make you wish you hadn't survived. The bottom line for us is that for aviators, pyrotechnics are the least satisfactory signalling devices. However, they are required to be carried by regulation in some situations. In many circumstances, a handheld flare is probably better for starting a fire in wet conditions than for attracting attention. Skyblazer even makes a half size hand flare marketed as a fire starter. Flares are most useful in situations where building a signal fire could be difficult or impossible, such as in the Arctic, above the tree line or in a desert with little or no vegetation (like the Sahara). Smoke signals (we're talking about commercial pyrotechnic smoke signaling devices here, not a smoky signal fire) can be effective in some instances, but are not a high priority either, in my opinion. They are best used to add a great deal of additional visibility to an existing smoky fire signal. The orange smoke can also be used to dye snow for ground signals, if done carefully. One common pyrotechnic that an aviator is likely to run into is the military Mk 13 day/night marine handheld flare manufactured by Kilgor. The 5 1/2 by 1 1/2 inch diameter tube has a smoke flare on one end and red signal flare on the other, each of which lasts about 20-30 seconds. When you can find them, expect to pay around $55 each. An alternative that seems to perform as well or better is the Pains-Wessex Day Night Mk 14, but at $62.50, they are not exactly cheap. It has a plastic barrel and threaded end caps which proved easier to use with cold hands, though the Mk 13's friction fit caps could be taken off with your teeth easy enough. Both activate by breaking the seal with a thumb tap and pulling the tab to lite the flare or smoke. The correct method of operation isn't intuitive and not always easy in any case. Either unit will do, but neither is a particularly useful, in my opinion. Both Orion and Skyblazer make USCG approved marine handheld flares which burn for approx 2 minutes, seem to be equally bright and are about the size of a conventional road flare, though the Skyblazer is a tad slimmer in diameter. The longer burn time is a plus, but they are not easily lit and require the user to remove the cap and use it to strike the flare end to light it off, just like a typical road flare. This is very difficult to do from in the water and not exactly easy under any but the most calm circumstances, such as on land. Pains-Wessex also makes a SOLAS approved hand flare, the "Mk 6 Red Hand Flare," which is only rated for 1 minute burn time (though we have found it generally lasts longer in tests), but is extremely bright, much brighter than the others, leaving its metal tube glowing red hot in the darkness. It is about the same length as the others, but about 1/8 in fatter. It is much easier to ignite. A plastic handle on the bottom unlocks with a pull and twist and is fired by striking it up into the body of the flare. It can be unlocked with one hand, with difficulty, and ignited as long as something solid is around to strike it upon. The Pains-Wessex Mk 6 Red Hand Flare is my top choice for raft use, by a significant margin, but they are expensive, heavy and somewhat bulky. Not exactly ideal for aviation use. For alternative smoke flares to the Mk 13, the choice is between Skyblazer, which makes a small (1 1/4 in. dia. x 1 3/4 in. high) 45 second smoke canister and Pains Wessex which offers a one minute handheld smoke and a 3 minute SOLAS approved canister smoke. The Skyblazer smoke cannot be held once ignited by pulling the short chain and must be set down or floated. If it is tipped when being put in the water, easy enough to do, it will tend to fizzle out, a serious drawback, but not a concern on land. The Pains-Wessex hand smoke operates just like the Mk 6 handheld flare, but is slightly larger in diameter. The large (3 1/2 x 6 1/4 in.) canister smoke must also be set on the ground or in the water after pulling the cord igniter, but it floats much better and is not easily upset, you can literally toss it into the water and it will right itself. It's the best, but is really far to big and heavy for typical aviation use. All make huge billowing clouds of highly visible orange smoke, but it is rapidly dissipated with the slightest breeze. So again, searchers had best be looking in your direction. With but a single exception, commercial aerial flares are designed strictly for marine use. Marine aerial flares don't always burn out before reaching the ground. If these marine flares are used over land they can, and have, started fires. Pains-Wessex and Orion make mini-flare kits which use a "pen" launcher onto which the small flare cartridges either latch or screw, respectively. The Pains-Wessex "Miniflare 3" ($74) comes in a nifty, but heavy, rubber case which holds the launcher and eight flares. The Orion "Pocket Rocket" ($20) comes with a flimsy zip-lock plastic bag and three flares. An optional so-called "pouch" is a piece of foam with elastic strips sew onto the surface to hold the launcher and six flares. You can buy extra or replacement flares for the Pocket Rocket (3 for $9.50) but not for the Miniflare 3. While I like the quality of the Miniflare 3 and its well designed case, the Pocket Rocket was a marginally better performer and a much better value. The launchers are similar, with a spring-loaded "knob" on the side which is pulled down and then released to fire the flare. The Pocket Rocket has a slot at the bottom of the slide so you can rotate the knob sideways where it is held cocked and ready to fire. A small projection, designed to prevent accidental firing, makes it somewhat difficult to fire it off when you want to. Neither is easy to fire, especially with cold hands or if the survivor hasn't got strong hands. Some of my volunteer testers ended up using two hands, one to hold the launcher, the other to work the firing pin. I am aware that some testers have had misfires because the trigger wasn't pulled all the way down and was released prematurely. Standard pistol fired meteor type flares are available from Orion in both 12 gauge (pistol $22, meteors 3 for $11.50) and 25 mm (pistol $120, meteors 3 for $41). The pistols have a break away breech and after loading a meteor shell, the hammer is manually cocked and then fired with the trigger. The 12 ga. pistol is lightweight plastic, the 25 mm is very heavy die-cast metal and, as such, not suitable for aviation use. Neither unit is very compact. Both are easy to operate. Skyblazer's "XLT" aerial flare is a self-contained unit, 4 7/8 in. x 1 in. diameter, about the size of a "magic marker." To launch you press on a button on top which releases the plastic body of the flare, then pull the barrel up until is clicks into place. This forms a barrel to ensure it goes where it is aimed. Earlier versions that lacked this feature had occasional problems. Unscrewing the cap on the bottom allows a loop of chain to drop down. Aim skyward and pull the chain to fire. Very neat and simple and nothing to get lost. The Skyblazers are just about foolproof (with the exception that they can still be pointed at someone, causing serious or fatal injuries), a good idea with such products. The XLT is also available as an "XLT Wilderness Flare" which is designed to extinguish before returning to earth. THIS IS THE ONLY AERIAL FLARE SAFE FOR USE ON LAND. With the exception of the Orion 12 ga., performance of the all the meteors is adequate with burn times of 7.3 to 8.5 seconds, the bigger ones performing better, reaching higher and being brighter, than the small ones, as you might expect. The Orion 12 ga. is the only big surprise, giving the worst overall performance. Overall, I prefer the Skyblazers for aviation use. They are simple, waterproof, one piece, reasonably light and virtually foolproof. SOLAS requirements for an aerial flare dictate use of a parachute to gain the burn time required. Orion makes a parachute flare to fit its 25 mm pistol ($43) and Pains-Wessex makes a parachute flare integrated into a tube launcher, 10 3/8 in. x 1 3/4 in. diameter ($65). The Pains-Wessex operates by removing a protective endcap, pulling a safety pin and then operating a trigger arm. When tested, we had a couple misfires with the Orion, though they did work on the second try. The Pains-Wessex outperformed the Orion by a significant margin, lasting half again longer, 46 vs 30 seconds, and being a whole lot brighter. There was no contest, except for price and size. Neither of these would be well suited for aviation use due to their size and weight. My recommendation for a pyrotechnic device for aviation life raft use is the Skyblazer XLT. In a raft they will serve to attract the attention of a passing boat or one being vectored to you by SAR. I'd recommend that a minimum of six be packed. If space is a real premium, the Orion Pocket Rocket would be my fallback. If space and weight are less of a concern, you might want to include a few Pains Wessex Mk 6 hand flares. For land use, I recommend flares only if flights will take you over terrain which offers no possibility of making a signal fire. If space and weight are tight, a few Orion or Skyblazer hand flares and some Skyblazer smokes would be a good bet. For those convinced they must have aerial flares, the XLT Wilderness Flare is the best value for pilots. © 1994 - 2006 Douglas S. Ritter & Equipped To Survive Foundation, Inc.